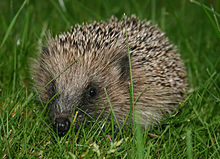 Nocturnal (Latin: nox - night, darkness) animals are animals that are mainly active during the night. They hunt or feed during the night, and sleep during the day. Diurnal animals do it the other way around. Scientists sometimes use the word crepuscular to describe nocturnal animals that are not active when it is very dark at night; they are mostly active near dawn, dusk, and sometimes when the moon makes a lot of light. Nocturnal animals also have a high sensitivity to their eyes, and when flashed really brightly with lights appear red, orange, amber, or topaz. ↑ Collins Pocket Latin Dictionary (First ed.). HarperCollins. 2008. p. 230. ISBN 9780007263745. ↑ "Nocturnal". BBC. Retrieved 2011-04-25. This page was last changed on 5 June 2016, at 16:42.